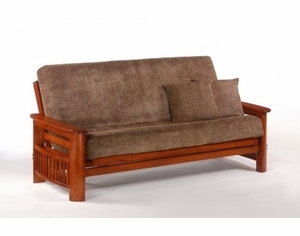 This item includes the Portofino Sofa Bed frame only, a futon mattress is not included. This frame is available as a full or queen size in a cherry, honey oak, or java finish. If you are looking for a mattress, please see our Futon Mattresses section for Wolf & Otis brand premium quality mattresses. The Portofino frame can also be special ordered in Chair and Lounger sizes. Please contact us for details. The Portofino Frame is beautifully finished and features a high-end elaborate design with state-of-the-art construction assuring strength, performance, & durability. The frame's support system allows you to quickly convert between Sofa, Recliner and Bed positions in seconds. The Portofino Futon Frame features an elegant curvature and parallel, mission-inspired sides that provide a classy yet modern appeal. Among the most versatile futon frames to date, the Portofino frame contains flip-up arm top storage compartments and lower magazine racks on each side for storing living room essentials like TV remotes and magazines. Constructed with Solid Malaysian Rubberwood and expert craftsmanship, the Portofino Futon Frame will compliment any living room with the most versatile design in the industry. � Flip-up arm tops & magazine racks on each side. Flip-up arm tops & magazine racks on each side. Adjustable Back Angle for multiple positions. *Shown above with futon mattress, drawers and cover, not included.